It’s heeeere! It’s the most anticipated 360 camera of 2018, the revolutionary Kandao Qoocam – and it has arrived! In this post, I discuss why this camera is so important and why it’s revolutionary. I will also post an unboxing video and demo, and answer your questions tomorrow at 9am Pacific Time on 360 Rumors’ YouTube channel! Just post your questions in the comments below. Why is Kandao Qoocam revolutionary? 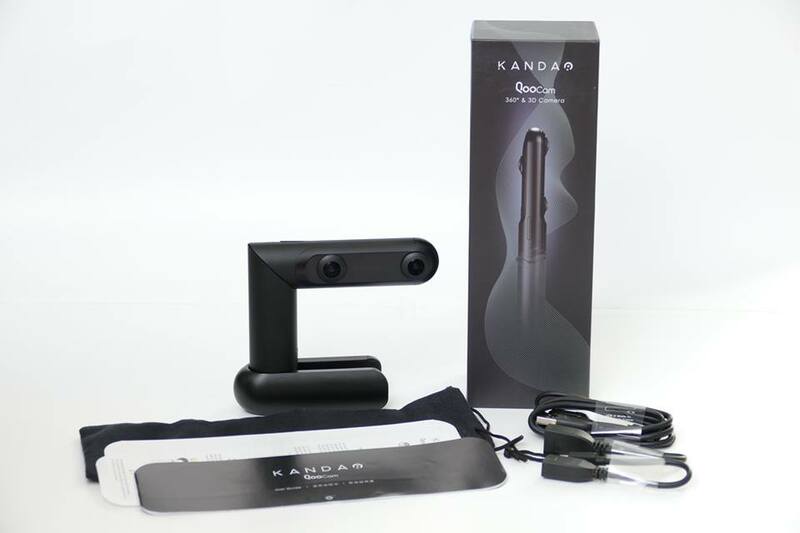 What’s so special about the Kandao Qoocam? 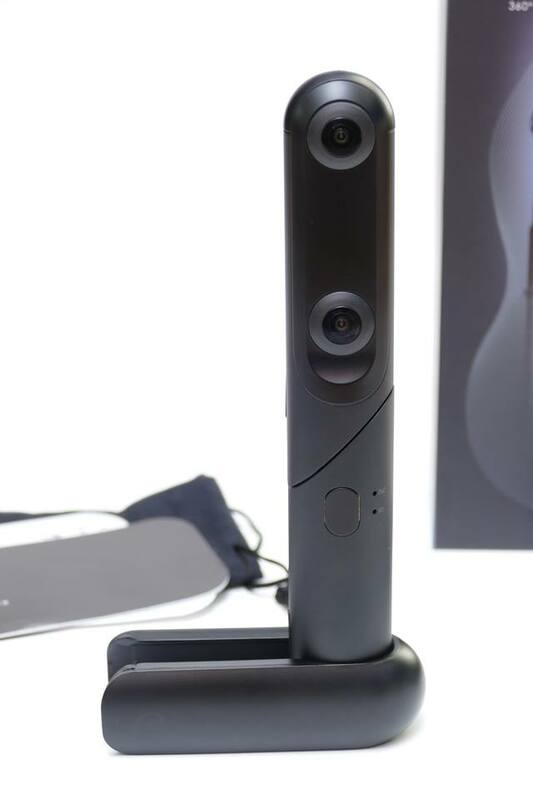 It’s a 360 camera that converts to a VR180 / 3D 180 camera. Let me tell you why that is such an important feature. But 360 cameras can be intimidating to beginners. Photos and videos often have to be combined, or “stitched” together, and for some cameras, stitching can take literally hours for a day’s worth of videos (I’m looking at you, Gear 360!). Shooting in 360 can also be confusing, because it needs a different shooting technique. Some techniques that people use for regular photos and videos don’t apply at all, such as the rule of thirds. And for professionals, shooting in 360 is especially challenging because it’s hard to direct the viewer’s attention in 360. 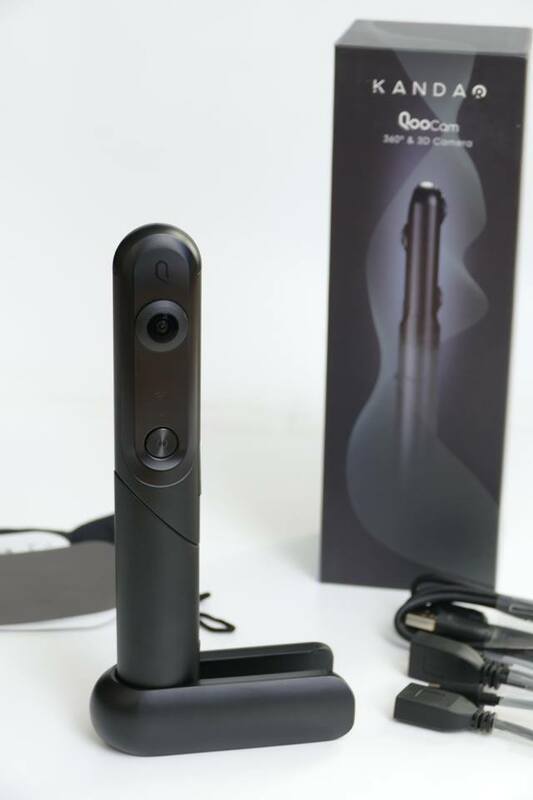 Kandao Qoocam unboxing: the lens cover doubles as a stand in either 360 mode or the Qoocam’s cantilevered VR180 mode. VR180 is a format that can address those issues, while retaining the immersiveness of 360. By shooting only a 180 view, you can frame the subject the same way as you would a smartphone. For professionals, shooting in 180 is also much easier. You can direct the audience as easily as a regular camera. VR180 is also in 3D, which presents a heightened immersiveness. Stitching is also much faster (some VR180 cameras don’t even need stitching). I’ve shot with VR180 (LucidCam and Lenovo Mirage) and I can tell you that it’s extremely easy to use. Really, it’s as easy as shooting with a smartphone. But VR180 isn’t an answer to everything. Unlike 360, you do have to aim it and it doesn’t have the amazing stabilization potential of 360 cameras. That is precisely the raison d’etre for Kandao Qoocam. Many times, I found myself wondering whether I should bring a 360 camera, or a VR180 camera. With the Qoocam, I don’t have to choose. I can have both! So you can understand why I’m so excited about it! 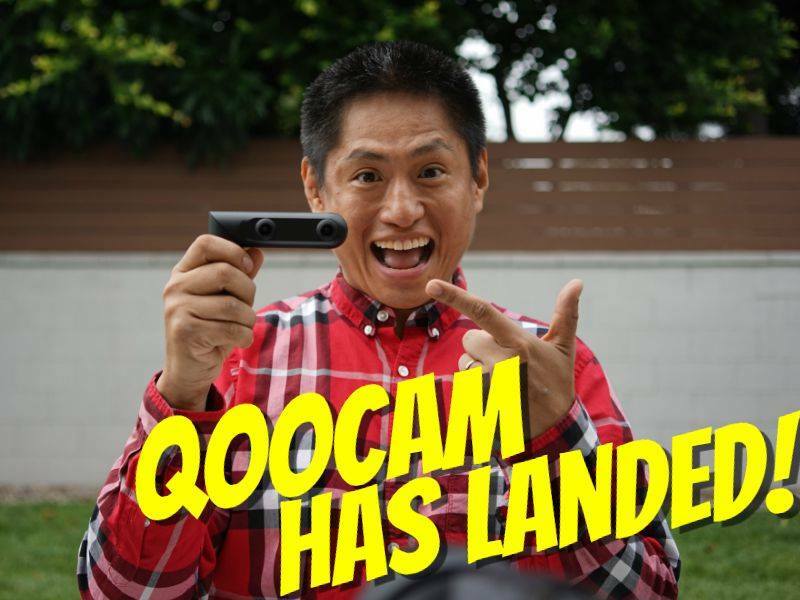 Tomorrow, I will post an unboxing and demo video for Qoocam, at 9am Pacific Time on 360 Rumors YouTube channel. I’m sure you have plenty of questions about Qoocam — post your questions in the comments below, and I’ll answer them in the video! In the meantime, if you haven’t seen it, please see my hands-on report here. Hi Mic. Interested in how is it possible to not see the hand holding the camera in VR180 usage. I second Bill’s comment. Looking at the picture of you at the top of this page, I see some substantial knuckles that are very clearly forward of the lenses. Therefore I cannot see how Qoocam can avoid recording them. I noticed on Mirage shots that anything sticking out from under the camera – even slightly – is picked up by the lenses. The Vuze XR seems to have circumvented that problem by having the handle slightly behind the lenses when they are in 3D 180 position. Oh ok je suis desolee. I misunderstood haha Indeed, the instructions suggest to hold the camera at the base of its handle to move it further away from the lens. But the hand will still show up. To make it invisible, you need a selfie stick with ballhead or similar. One way to get around that without having to use a selfie stick might be to design some kind of secondary handle that attaches or clips to the back of this one. The problem with using a selfie stick with a 3D 180 camera is that you really want the lenses to be no higher than the height of your eyes. Otherwise the images will feel like you are floating above the scene or the people around you – an effect that can work with 360 but not so much with 3D 180. Ok in vr180 while i am holding the camera i do see half of my hand. If you use a selfie stick with ballhead or similar, you can avoid having your hand appear in the shot. Figured as much. So a selfie stick or a big hand in shot. Nice design except for that. Which is a big fail. Can that handle be twisted to the rear a bit? > Can that handle be twisted to the rear a bit? From the look of it, I think it has to “click” in that position to work. A simple solution might have been to place the lenses a bit higher so the handle would have needed to be inclined forward for the lenses to point to the front. I agree that it would have been nice for the handle to slant back so that you’d avoid seeing your hand in shots without a stick/tripod of some sort, but, to be fair, this is an issue with _every_ 180 camera out there (at least in the prosumer and under range), so it’s not so much a fail, in my opinion, as a lack of a clear improvement. 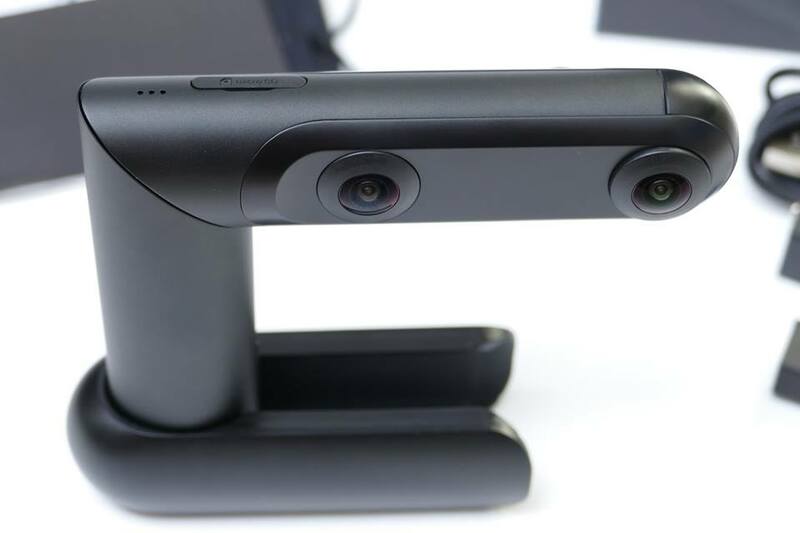 From the looks of it, neither the forthcoming Yi Horizon nor the Vuze XR would have that problem since the Yi has lenses that are on a raised surface at the front of the body while the XR has lenses that are forward of the handle when in 3D 180 mode. I can hold my Lenovo Mirage from the back edges to eliminate fingers in view. @Francois: Agreed, both of those look like better solutions, just not ones I can buy yet, and I also completely agree that altering the angle of the handle would have alleviated the problem. I just meant that none of the sub-$500 *current* VR 180 solutions are great. @Bill: Yup, I need to do that with my LucidCam too, and it’s a pain. I’ve got a small rig with an adapter, some rods, and a handle that let me keep the camera ahead of my hand, but it’s annoying. In general, I am somewhat amazed that none of the designers of the initial wave of (sub-$500, at least) products really thought about the need to hold the camera. I know what you mean ! I’ve been waiting for the Horizon ever since Google announced it in June 2017. I really thought I would be shooting with it by this summer. Hi Francois. If you want Micro 4/3 version of VR180, check out the Z Cam K1 Pro or the iZugar Z2XL180. Very nice quality although quite pricey. I know the K1 well. It’s too big, way too expensive, not ergonomic and doesn’t have an LCD display either. I think that Panasonic could produce a stereo version of one of their micro 4/3 cameras for less than half the price of the K1 and have something more compact and simple to hold and with a built-in LCD display. My other question is in regards the claim by Kandao that the Qoocam conforms to the VR180 standard. Is that correct ? For example, are stills saved as vr.jpg files or as SBS jpgs ? Will check it out but doesnt seem like it yet. For now. For those that haven’t watched Mic’s YT report yet, the answer is “not yet”. VR180 compatibility may come in an upcoming firmware update – along with several other features that haven’t been implemented yet. How is the sync in 3D 180 mode ? Qoocam’s first video demos were badly out of sync but the last one they showed looked perfect. However, at the same time they showed the last clip (the zoo visit), they also posted a 3D still of a peacock which was badly out of sync. So I am wondering if things have improved with the production models. Bad sync is the nightmare of 3D photographers and videographers. In all the still and video samples I have seen shot by Lenovo Mirage users, the sync always appeared to be quite good. However, the opposite is true of the LucidCam where the few stills with action in them that I have seen appeared out of sync and many clips also have poor sync. Ok i will try to test this! Thanka Francois! I can’t wait to see the video! As the first backer on KS, I’m a bit miffed that you got yours first. 😉 Hopefully, mine will be arriving soon! Hey Mic, if you had to choose between this or the Mirage for vr180 exclusively, which would you go with? Obviously this one has a lot more to offer outside of vr180, so I guess you could take that into consideration. Let me just interject here by saying first that you should take a look at Mic’s YT report on the Qoocam. Essentially, he says that in 3D 180 mode (it’s not yet VR180 compliant), video quality is on par with the Mirage. But for stills, the Mirage is a bit sharper. I would personally add that the only Qoocam still sample I have seen with movement in it contains a bad sync error. Therefore I would really need to see further stills tests. For me, bad sync is a deal breaker. The other point that Mic makes is that – being a big 360 enthusiast himself – he kinda always wants to have such a camera with him when he goes out. Therefore, having to choose between one or the other is no longer a problem with the Qoocam. The other feature that the Qoocam offers is depth map creation, which allows you to change the focus after the picture has been taken or to change the background altogether. If that matters to you, then the Qoocam has an advantage. Thanks for the insight. And regarding your comment somewhere else here, Panasonic did announce back in Jan that it was developing some type of adaptor/lens for the GH5 for vr180… though nothing has been said about it since, so it must be hanging out with the Horizon down in the Cayman Islands. In regards the Panasonic idea, I based it on those news reports on that GH5 adapter. I honestly don’t see how such an adapter could work. So I just extrapolated that Panasonic would realize that creating a VR180 camera from scratch might be the better solution and they would make it a micro 4/3 camera to have an edge over the current under $1000 cameras announced. Well, it was in the press release from Google back in Jan, so it was “official”, not just news reports. I assumed it would be more of a lens than an adaptor. Panasonic did have a 3D lens years ago (a crappy one), and there are other 3D lenses available for other camera mounts, so i would think its possible, there just need to make the lenses super wide. Still keeping my fingers crossed, I’d be surprised if an announcement like that would come from two huge companies only to turn into vaporware. I know that report was “official”. All I am saying is I don’t see any way that could be implemented. That 3D lens of theirs (from a few years ago) was sequentially exposing the left and right image, which resulted in mediocre stereo sync. A friend of mine tested it extensively. If that’s what they have in mind, it’s a guaranteed looser. Anyhow, I am not interested in an adapter as it means you also have to buy another expensive camera you might not otherwise purchase. And it’s not a given that owners of a GH5 would automatically care for VR180. Anyhow, all we can do at this point and wait and see what comes up next. I am sure there will be more surprises as there have been since the beginning of the year. That Vuze XR camera, for example, came as a complete surprise. For now, I am sitting back and not buying anything. I know you wanted to get into VR180 as fast as possible and so you got the Mirage. I would suggest you continue to make good use of it for months to come and not feel in a rush to switch to something else till there are a lot more choices out there. I’d really need to see action stills taken with the Qoocam. Maybe you can post some ? The ones I took are not worthy of posting so i’ll just email them to you. 🙂 but i’ll take some that are worth showing. Hi Brian. I would choose Qoocam. Even though Mirage photos are better quality, the Qoocam’s versatility is more important to me. Sometimes i want a 360 camera’s ability to shoot without aiming and have awesome stabilization. Qoocam’s 360 mode has that. Great Qoocam first impression video. Thanks. I have a somewhat specialized potential application for the Qoocam – for filming oral surgery. The ideal POV of course being as close to the surgeon’s eyes as possible and with a device that is not too heavy so it can be head mounted. I am fairly comfortable with what can be done in Post Production but I would really like to know what could be done in Streaming. The ultimate (maybe stretch / goal) being to stream a stabilized frame locked to the patient’s mouth up on monitors in the operating room so that trainee surgeons can see properly in real-time without having the crowd around the surgeon actually performing the operation. I’d really appreciate your view on whether this sounds feasible even if it might be a year or so away and require some development.